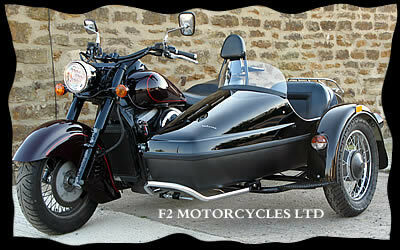 This site is owned and run by F2 Motorcycles Ltd and is designed to cover our range of universal sidecars. Other products offered by F2 Motorcycles Ltd can be found on our main site. F2 Motorcycles Ltd are the sole UK importer and distributor for these universal sidecars. All sidecars stocked by F2 Motorcycles Ltd are supplied to fit on the left side of the motorcycle in accordance with UK law. The Velorex UK range consisting of the CHASSIS, CARGO, SPORT and TOUR high quality sidecars. We have been involved with this manufacturer for many years and originally helped develop the current fitting kit. They are very well made and can be fitted to large motorcycles whilst still being light enough for motorcycles as small as 250cc. All of our sidecars can be fitted to most traditional steel framed twin shock motorcycles. They are not designed to be fitted to box section frames, or frames where the engine is used as part of the frame. Please note, if you are comparing sidecars with other manufacturers, we never use any un-damped cheap trailer suspension parts. All our sidecars are fitted with 20 mm axles, braced swinging arms and a fully damped coil over shock absorber. 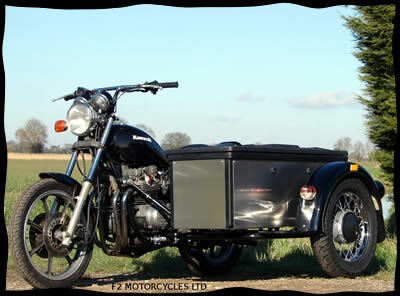 All our sidecars are supplied in black only. It is almost impossible for a factory to supply a perfect match even with a paint code. However many owners have their sidecar colour matched in the UK by a reputable auto sprayer. We offer a range of options from a basic chassis for those who wish to build their own one off special, right through to a complete sidecar supplied and fitted to your bike.